King Scorpion . . . In the language of ancient Egypt -- Hotep means pleasing to god. '; retValue += 'write in your name and email address and click the Sign Up button. 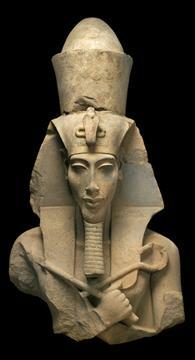 A German expedition has unearthed part of a colossal statue of this 18th dynasty pharaoh. Minister of Culture Farouq Hosni said that "the red granite head and shoulders were found in the pharaoh's temple area on the west bank of the Nile at Luxor." Secretary General of the Supreme Council of Antiquities Zahi Hawass said that: The one-metre, high bust is in good condition. Not since Howard Carter shone a light into the vault of Tutankhamun in 1922 and said: "I see wonderful things" has a new tomb been discovered in the Valley of the Kings. Archaeologists made the find in a site just yards from the tomb of Tutankhamun's tomb. He languished for decades in a foreign land. 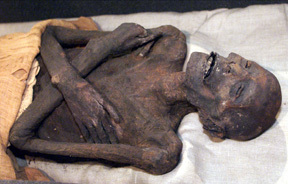 This mummy was used as a sideshow curiosity. Find out the truth about the so-called "Niagra Mummy." 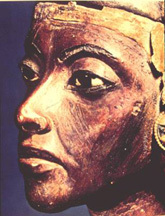 A statue of Queen Tiye (Ti) has been unearthed. One of the most important women in ancient Egypt, the queen is believed to be the mother of Tutankhamun. [Click on the image, below] Always building, our website will please mystery lovers, history buffs, amateur Egyptologists, travel fans, adventure addicts and just about anyone that has ever been fascinated with the art, culture and the people of ancient Egypt. Our site will feature a serialized MURDER MYSTERY set in the 18th Dynasty--To enhance your reading experience, there is a LIST of KINGS, GODS, a Glossary and there is The PLACE of INSPIRATION, with selections from the ancient texts, songs, chants and prayers--We will update this section regularly. Professor Wendrich excavates in Egypt. See DIG SITES!